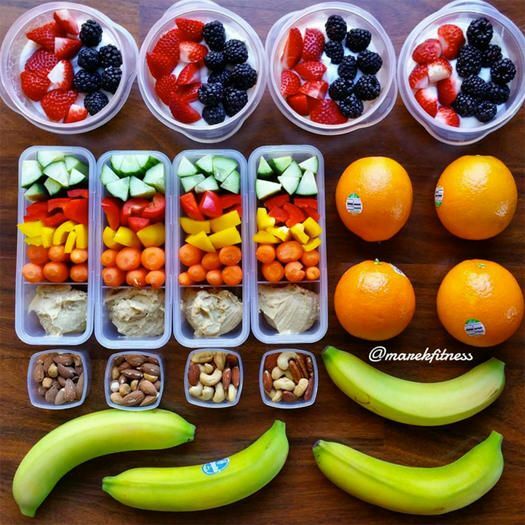 If you’ve dabbled with meal prep, you know how much of a lifesaver it is during a busy week. If you don’t make the time to prepare convenient, nutritious meal options, you are often coerced into making far less healthy choices. If you don’t pack a lunch, you often reach for the vending machine or fast food, and in the evening, the take out or pizza often seem like the easiest way to go. That’s why we basically belong to the church of meal prep. This Sunday ritual is what keeps us going the rest of the week, and our faith in its power to keep you healthy through the week is strong. But there is a downside: meal prep can be time consuming. If you don’t particularly enjoy spending time in the kitchen and cooking, it can be a complete burden. After all, we just want to chill out on the weekends – not work more. That’s why getting things done efficiently and effectively is the best away to stay consistent with meal prep, and perhaps, with these clever meal prep tips and tricks, you might even fall in love with it. Like, really simple. You might be checking out some people’s Instagram posts showing off their meal prep glory and thinking you need to live up to this standard. News flash: there is no standard. The only goal here is to make enough healthy food to fuel you, and it doesn’t have to be much. Moreover, if you’re perusing Pinterest for recipes and trying to build your grocery list around it, you’re going to end up spending tons of dough, and spending a LOT of time working through unfamiliar recipes in the kitchen. Simplicity is defined by you. What do you know how to cook, and what do you enjoy eating? Think of a few things and start there. Most of the time, I just pick a few protein options and a few veggie options and think of what’s going to pair up well with those things. For example, if you like chicken, broccoli and sweet potato – start there. Marinate and grill a few chicken breasts, roast a tray of sweet potato and pre-cook a container of broccoli florets. Pair these with some salad or a quick tinned salmon and you have yourself a few lunch and dinner options. Instead of planning out elaborate recipes, try to plan out different combinations of food that will all complement one another. Work AT your skill level, and it will naturally advance. This isn’t Cutthroat Kitchen. When you meal prep, use a couple of cast iron skillets and a couple sheet pans or glass oven dishes. This is basically all you need besides a slow cooker or pressure cooker (which we’ll get to later). You can cook nearly any vegetable or cut of meat this way, and it’s pretty hands-off. Plus, you can cook a few dishes at once if you organize the pans correctly and have varying sizes. For example, if you can fit 3-4 pans into the oven, toss a few salmon filets in one, a big batch of veggies you enjoy roasted together on another, and some fajitas on another. You can even make sheet pan eggs. There, you have 2-3 protein dishes and 2-3 veggie dishes done. They might cook at varying times, but just be mindful of it and take them out/rotate when necessary. When one dish is done, you can start another if you have more to cook. It’s like an assembly line, only it’s just you and the oven. This method is going to make you feel like you’re cheating, and it’s a super easy way to get a lot done in a little time. While your food is baking, you can start additional prep or cook on the stove top. Check out our favorite sheet pan meals here. The absolute best hack for getting ahead is freezing some meals. This ensures shelf life and some food later down the road. This gives you a back-up plan in the coming week in case you end up falling short on food and you’re in a pinch, and it gives you options during a crazy-hectic weekend when you simply don’t find the time to meal prep. Freezing even just 1-2 portions of each meal you batch cook will add up over time, and you’ll be thankful you thought of it. You can freeze in batches or as single servings. It’s best to freeze food in plastic bags laid flat. Most meals will last 2-6 months if you freeze them. Getting accustomed to the guidelines regarding which foods freeze well and which foods don’t is the only learning curve to making this strategy successful. As a general rule, foods contained in sauces or broths freeze exceptionally well and even become more flavorful over time. Soups, stews, curries, and the like are the gift that keeps on giving. Watery veggies don’t do terribly well on their own. You can freeze egg bakes, casseroles, rice dishes, flash-steamed veggies, fruits, and so much more. Developing this habit will also help you to eliminate food waste and save a few dollars. Using the slow cooker or the pressure cooker is something we stand by. Both allow you to toss in the ingredients and simply press a button, and it doesn’t get much better than that. If you’re not already using yours weekly, you should definitely give it a go. Many people have a slow cooker, but the pressure cooker or Instant Pot really takes meal prep to the next level. You can cook typical slow cooker recipes in a small fraction of the time, meaning you can cycle through cooking a few dishes in a single day. These handy kitchen appliances also make it much more feasible to create interesting and unique dishes without much effort. If you look at recipes, they’re often simple and flavorful without the fuss of stove-top cooking. You can make meal prep staples like rice and quinoa without tending to the pot, soup without the simmering, fancy dishes like risotto without the stirring, and even breakfast dishes like oats or egg bakes. It’s also an incredibly efficient way of cooking large cuts of meat that will feed you effortlessly throughout a 7-day period. Finally, you can easily incorporate lots of ingredients and flavors which will help you beat the boredom of repeating meals that often comes with meal prepping. Check out our favorite paleo Instant Pot recipes. There are days when you feel a bit peckish between meals. Sometimes, you end up out of the house longer than anticipated, and that need for immediate sustenance grows strong, leading us straight to the danger zone of easy pastries, office food, candy bars, and otherwise non-nutritive snack items to tide us over. Giving yourself options for snacks makes the whole debacle a lot easier to manage, and helps you to resist sneaky sugar cravings. You may be fine with bars you like (I always stock up on RXBAR for the week!) or fruit which requires no prep-work, but just boiling a dozen eggs, chopping up some veggies and making a dip for them, or making some bars yourself can be the end of your vending machine days. Pre-portioning nut butter and nuts is also a good idea. Make sure you have 2-3 items on the menu that are portable, light, and nourishing. Focus on ways you can get in protein and fats which will offer up sustainable energy and focus in between meals. Mason jars aren’t just going to look cool when you show up to the office with one. They’re actually incredible handy for easy-to-prep foods that are layered, and they’re super portable. The tight seal on top will also help keep your food fresh and prevent leakage in your lunch box. There are so many ways to utilize these fun jars – salads, yoghurt parfaits, overnight oats, noodles, and even egg casseroles. They’re microwave-safe and oven-safe with no BPAs, so if you need to heat things up, you can easily transfer your meal. You can build a salad in a jar like the ones above, making sure to put crunchy veggies and dressing on the bottom, and lighter leafy veggies up top. Add grains, beans, or roasted veggies to keep things fresh. Toss some garnishes in there like fresh herbs or seeds, and mix and match salads throughout the week. You can shake things up when you’re ready to get the dressing dispersed, and serve in a bowl. Making overnight oats is as simple as tossing some oats into a jar with milk of choice and perhaps some yoghurt, blending in your favorite additions – I love frozen fruit and nut butter. Bake scrambled eggs directly in mason jars for an omelet in a jar. Get creative! Let me explain. This helps us keep things super simple while adding variety to the mix and minimizing the ingredients list. Let’s say you like chicken. Instead of making one chicken dish, make a bulk batch of chicken seasoned and sauced in different ways. Marinades, dressings, interesting spice blends, and other add-ons will make it easy for you to season a few breasts one way and a few another, essentially giving you 2-3 different meals without the effort that usually goes into it. You can easily divide up a sheet pan using aluminum foil and utilize the brilliant sheet pan hack for this one, dividing up the different flavors in each batch. Skewers also work well for this. You can also use this rule swapped around. Instead of switching spices, you can use the same spices or marinade on 2-3 different types of protein or veggies. Do you catch my drift? Meal prep is as much about creating satisfying and compelling meals as it is about efficiency and convenience, so think of ways you can combine your technique to encompass a few different recipes. This is an easy way to make pre-portioned anything. You can certainly add some actual muffins to the meal prep mix, but don’t limit yourself. Like sheet pans, this is an easy way to get a few things done at once, and cook whatever you’re making alongside other dishes in the oven. A few examples include egg muffins, baked oatmeal, sweet potato mash, meatloaf muffins or meatballs, fish cakes, hash browns… the list goes on and on forever (seriously). This helps you eyeball portions easily, and most things muffin-shaped will freeze pretty well. Plus, they’ll heat up quickly! With an egg base that fluffs up well, you can incorporate other food items whether you add in some greens, some extra meat, or pizza toppings. Multi-tasking is a myth. I’m pretty sure science has proven you can only perform a single task at a time, and this is especially true with meal prep. Yes – these hacks bend the rules a bit and allow you to be as efficient as possible, but the truth is that meal prep takes prep in its own way. From recipe planning and shopping to having the right cooking tools and skills to make it work smoothly, you have to put in some time before you set up shop. That’s where the assembly line comes in. Chop all your ingredients ahead of time. Marinade and season anything that needs it. Break out the tool box and set up your meal prep containers to dish things out as they’re ready. Get to know the cooking times and align the meals in a certain order. If you have someone to help, ask! Use everything (and everyone) in your kitchen that you possibly can to get as much done at once. This way, you outsource the tasks to those tools and you can actually focus on the task at hand. Green smoothies are great for on-the-go breakfast or as a pre- or post-workout snack. Having pre-portioned smoothie ingredients ready to go means that you’ll have no excuses to reach for the chocolate bar or a muffin instead. Use small Ziplock bags or Tupperware containers to store pre-washed berries, spinach, and any other fruits you like. We like chopping and freezing bananas and mangos and using those instead of ice cubes when blending a smoothie. Frozen fruit like banana and papaya will also add more fluffiness to the drink. Check out our 7 days of green smoothies here. Having a daily salad is a solid strategy for getting plenty of nutrients and staying on track with your weight loss goals. But what if you don’t know what kind of salad you’ll feel like on any particular day? Well, you don’t need to decide right away. Making your own salad bar as part of the weekend meal prep is the best way to stick with your daily salad goals and to keep it fun and creative at the same time. Prepare a number of containers and leftover jars and fill them up with a variety of pre-washed and pre-chopped salad ingredients. Here are some of our favorites that keep well for a few days: baby spinach leaves, rocket/arugula, diced carrot, peppers and cucumbers, sliced radishes, cherry tomatoes, shredded cabbage, sliced fennel, sprouted beans, pre-cooked legumes and quinoa, sun-dried tomatoes, olives, sliced grilled chicken, turkey or beef, pickled red onions, cooked diced beetroot cubes, steamed broccoli, roasted sweet potato, pumpkin or baby white potatoes and the list goes on. Seriously, this one really works! Having a ready-made salad dressings makes you more likely to want to eat a salad, especially if your grilled chicken is drizzled with creamy ranch and your avocado is enhanced with a gorgeous honey mustard number. Most dressings will keep for up a week in the fridge, so you can make a jar of your favorite recipe ahead of time to enjoy through the week. We like to keep a bottle in the office as well. Check out these 10 delicious paleo salad dressings. This is when you get really clever with meal prep. Think of 2-3 base dishes that you can make on the weekend that can be used in multiple dishes throughout the week. For example, make a large batch of cooked ground beef with onions, carrots, celery and garlic and store in three portions. Heat up one portion with tinned tomatoes and some fresh herbs for a delicious pasta sauce; reheat and spice up the second portion with cumin, coriander seed and paprika for Mexican taco bowls; and used the rest for a comforting Shepherd’s pie. Another favorite is a whole roast chicken, which can be used for roast chicken and veggies meal, shredded chicken salads, and yummy chicken soup. Need a hit of caffeine in the morning but finding yourself rushing out the door before you can even put the kettle on? Consider making a pre-made iced tea or cold brew coffee ahead of time. This meal prep hack is especially useful in summer, when you want something cold and refreshing to wake you up. Store cold brew coffee in small mason jars in the fridge, ready for a pick up before you leave the house. Get a recipe for cold brew coffee here. Getting disorganised during a long day in the kitchen will break your spirit fast, and you’re more likely to call it quits early. From the beginning, you have to have your recipes accessible to you. Make sure you read them before you begin cooking them, and try to pin them up somewhere easy to reference in the kitchen. Make sure you have the appropriate sizes of containers for storage, the right tools, and enough space. Clear your head and your physical space before you begin to avoid feeling overwhelmed. While things are cooking, clean as you go. If you leave all the dishes for later, your meal prep is going to take a lot longer than 2-3 hours! When you store your food, keep it tidy and make sure to label everything – especially the things that go in the freezer! If you need a simple template to get started with meal prep, try out our 7-Day Make Ahead Meal Plan. This outlines everything from the start for you, so you don’t have to organize much on your own time. We think anyone can learn to love meal prep, so hopefully these tiny changes make a big difference, saving you both time and money. Before you start, make sure to check out our top recommendations for safe food storage, and some of our favorite healthy meal prep-friendly recipes!